CD review: "Just a Lucky So and So"
This review first appeared in the Feb. 18, 1994 issue of the North County Blade-Citizen (now North County Times). Now in his 70s, Charles Brown has granted Father Time no quarter. His keyboard work is as good as ever on his latest release, and his vocals still have that sly edge to them and remain as smooth and smoky as fine Kentucky bourbon. Brown's brand of the blues is of the jazz-tinged, after-hours variety; he was an early influence on both Nat "King" Cole and Ray Charles, and he maintains that supple, sophisticated blending of jazz and blues he helped define. The strings on his new album tend to get in the way of Brown's singing and piano, although the horn charts work quite well. 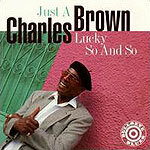 But even with the heavy-handed production, Brown's distinctive vocals and expressive piano come through loud and clear.